German-born theoretical physicist. 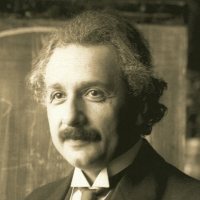 Developed the general theory of relativity, one of the two pillars of modern physics (alongside quantum mechanics). Was a big influence in the philosophy of science. Best known in popular culture for his mass–energy equivalence formula E = mc2. Received the 1921 Nobel Prize in Physics for his discovery of the law of the photoelectric effect, a pivotal step in the evolution of quantum theory. Success is failure in progress. © 2019 Guillermo Calvo. Powered by Jekyll & Minimal Mistakes.